Longvida® Optimized Curcumin was designed by university neuroscientists to bypass initial hydrolysis and deliver bioefficacious levels of unglucuronidated (free) curcumin to the brain and throughout the entire body. 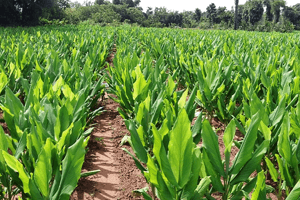 Exclusively licensed to Verdure Sciences®, patented Solid Lipid Curcumin Particle (SLCPTM) Technology enables the uptake of free curcumin to the blood and target tissues. 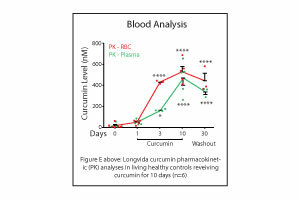 Extensively studied by independent researchers globally, Longvida® Optimized Curcumin is able to cross the blood-brain barrier, offering efficacious amounts of free curcumin at easily managed daily doses. Multiple clinical findings show that Longvida® Optimized Curcumin delivers free curcumin to target tissues. Studied extensively by independent academic and medical centers globally, Longvida® offers a 7.5 hour half-life, compared to the 2-3 hour half-life of standard curcumin. US Patent 9192644, EP Patent 1993365. Researchers with the University of Colorado clinically investigated Longvida’s ability to improve vascular endothelial function, as assessed by endothelium dependent dilation (EDD), in middle-aged and older adults. After 12 weeks of 2000mg per day of Longvida® Optimized Curcumin, brachial artery flow-mediated dilation (FMDba) was increased by 36% versus placebo, which showed no change. Results, published in January 2017, indicate that Longvida® improves vascular endothelial function by increasing nitric oxide bioavailability through a reduction in oxidative stress and inflammatory signaling in middle-aged and older adults. According to the authors, these results support evidence that supplementation of Longvida® may be a promising therapeutic option to improve vascular health. Further, this clinical provides additional support for Longvida’s efficacious ability to promote healthy aging. 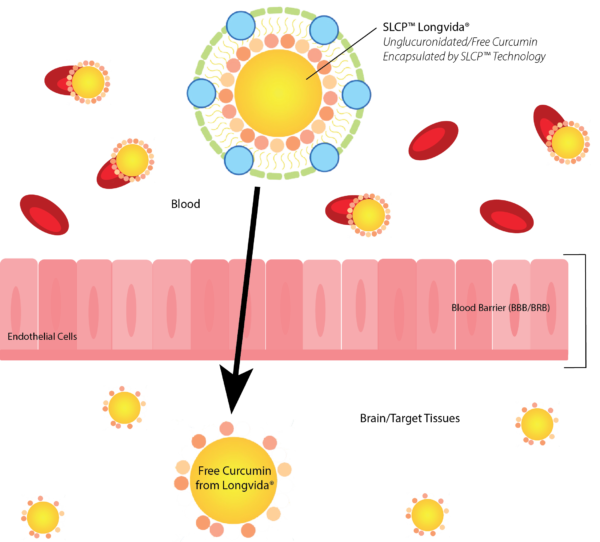 Cutting-edge SLCP™ Technology, or Solid Lipid Curcumin Particle Technology, is responsible for the ‘magic’ of Longvida®. While this technology may be magical, in essence, it required a lot of hard work and brilliant insights to develop. Longvida® is a patented, finely-tuned lipophilic matrix brought together in a gentle, multi-step process. The end product preserves and protects the curcumin from the harsh environment of the stomach, dissolves it at the point of absorption in the GI tract, and delivers the free form of curcumin (also called intact or native curcumin) into the blood stream and target tissues. SLCP™ Technology is an ideal absorption-promoting system, based on repeatable research data using validated analytical methodologies. Longvida® is free of harsh solvents and volatile oils.